After a couple of years of unsuccessfully trying to grow onions from commercial seed, I've gotten on to a heritage seed from way back that gives you prolific onions and so much more...its's really true that the old varieties are the best! I found these seeds locally, at a produce market that meets regularly in Mirboo Nth village, just up the road. A local lady there from Meeniyan had her garden seed collection and the name "Egyptian Walking Onion" jumped out at me! Apparently quite common in the cottage garden of old, its a prolific and hardy onion. 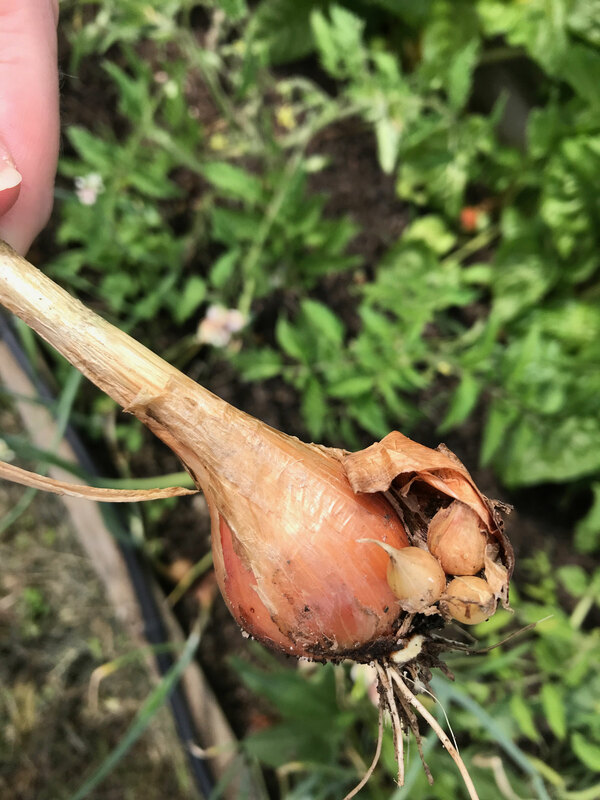 The bulbs, greens and even the top-set seeds can all be used in the kitchen, and you will have onions guaranteed every year! They are also know as "Tree Onions", "Egyptian Tree Onions", "Winter Onions" and "Perennial Onions". 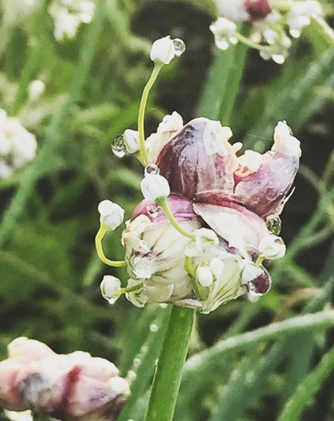 They are called tree onions because instead of the bubils that grow on the top of the plant grow green leaves and the whole plant looks like a small little tree. 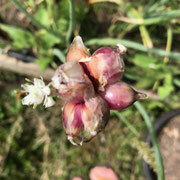 These onions also grow bulbs from the base as well, this may be due to the vigorous red dirt I have in my garden! 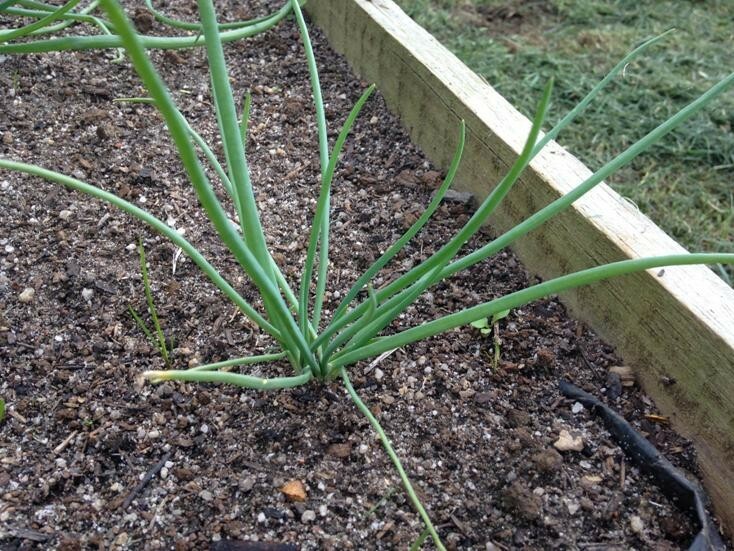 Uses for these onions are plentiful, you can use every last bit of the plant! 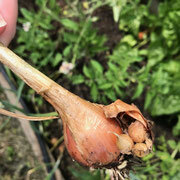 You can snip the green tops to use like chives when young, spring onions as they get older, use the bulbils as a garlic substitute and then also the bulb itself. 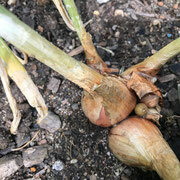 These onions, as with all onions, make a great barrier round the bottom of trees to ward off against pests. 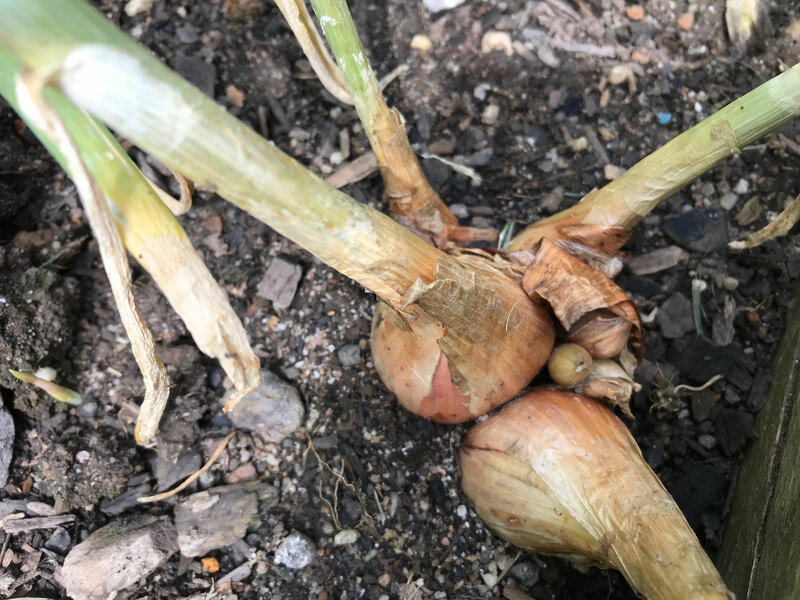 They will grow in any well drained soil and if you dig in compost (or horse manure a few weeks before planting) you will get bigger bulbs. 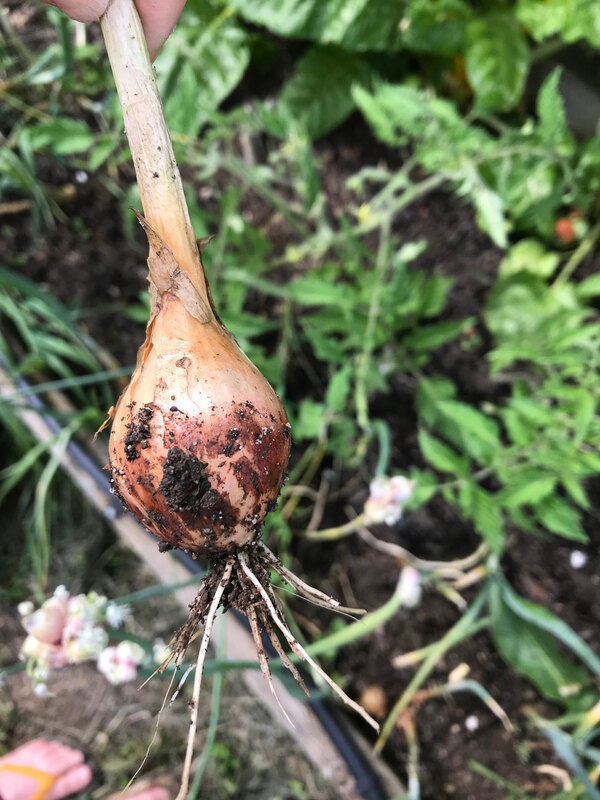 You can plant these little gems from Autumn to late winter, with the top poking out of the ground, ideal job to do with the kids, my 3 year old managed it fine as the seed bulbs are nice and big for little hands. Best of all they are easy to grow, leave them for 6-8 months and they will do their own thing! 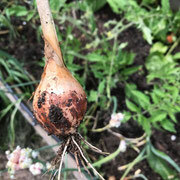 Rule of thumb is to plant onions on the shortest day of the year (21 June) and harvest them on the longest day (21 December), but with these onions you can safely leave them in the ground all year if you wish. The trickiest thing about these onions is finding the bulbs in the first place to sow. Check EBAY, seed suppliers or, like me, keep an eye out at your local farmers market and other community events. 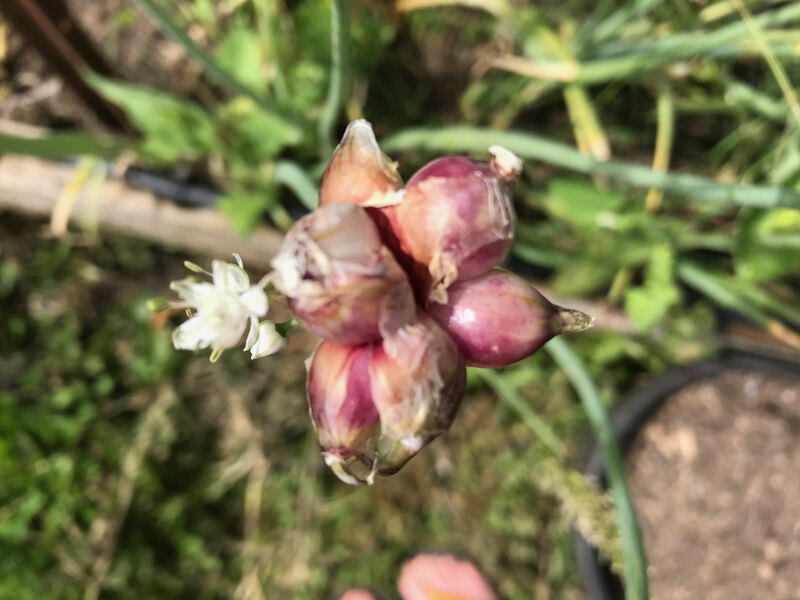 I have obtained lovely french shallots now too and have been planting them in the garden, so I now have two clumping varieties of onion and both are giving me a plentiful supply. I'm now growing my second lot from bulbs taken at my first harvest and now i have a huge bed dedicated to them! Happy Planting! These are wonderful onions. I have been growing them at our place near Foster for the last eight years. A friend gave us a small amount of stock in 2009. I usually get enough seed from the head of the plant for growing the next year's crop.. but not always. This year we had to use the full size bulbs instead. The crop we got was the best ever. The onion gets milder the longer you store it (initially can be quite sharp to eat too much of the raw onion). We also find that they store for ages.. up to 8 months is our record so far. Apart from the Egyptian walking onion there are a few other interesting heirloom vegetables we have grown - including the fantastically named Mangel Wurzel and Walking Stick Kale (which the chooks love). Summer also wouldn't be complete with heirloom tomatoes of course! You're welcome, Eimear. Yes, Lemon cucumbers are amazing too.. especially good when you pick them early. Enjoy the gardening! The best months are still to come.